The more we learn about addiction, the more we realize its complexity. Compounding that complexity is how specific each addict’s needs are. Specialized treatment is crucial. For years, though, addiction recovery has been based on a 30-day rehab model that makes individualized care a challenge. Though it’s been the standard, 30-day treatment models offer far less promise than 90-day treatment plans. Though it’s what most treatment centers have based their therapy on, the 30-day drug and alcohol treatment model is just that – a model. There’s no proof that 30-days is a magic number for rehabilitation. Considering the number of people who relapse after these programs, there may be more evidence of their failings than their successes. The truth is, 30-days should be the beginning of a process that incorporates personalized recovery methods. Treatment programs are most effective when they are part of a continuum of care. This is especially true of alcohol dependence, which is a chronic problem. Chronic issues need solutions that take time. Acute problems are treated more successfully with acute solutions, but all addictions are unique to the individual. Unless you get to the root cause of what’s fueling the addiction, relapse is almost guaranteed – and the root cause likely needs time for proper diagnosis. Most new research regarding treatment plans suggest that the 30-day treatment model is clinically inappropriate and perhaps even destructive for long-term recovery. One reason for this is that people who suffer from addiction need time to understand their illness. Most programs suggest that the first step toward recovery is admitting there’s a problem. For many, that alone takes time. Addicts abuse drugs and alcohol to protect themselves from certain painful truths; it is the nature of an individual suffering from addiction to conceal the reality of the problem and deny its existence. Hopefully, those entering treatment programs understand that they need help – but even then, the vast majority of people have a shallow understanding of their problems and what led them to substance abuse. If an addict does become a patient in a treatment program, he or she will often construct barriers to control, inhibit, and eventually stop the treatment plan. For example, patients may amend treatment plans with conditional clauses that define the duration, nature, and setting of treatment. Common patient objections to longer programs include needing to return to their lives, families, and jobs as soon as possible – only to return to rehab after relapsing. 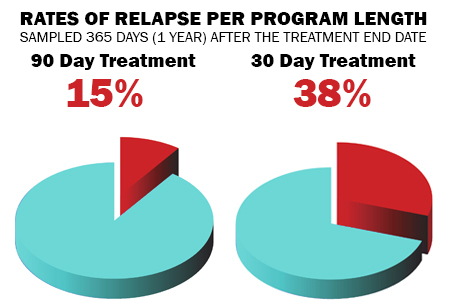 Patients choose the path of least resistance and leave the 30-day recovery program feeling strong, but the failure rate in these situations is startling. Many come away with negative feelings about their treatment. Patients are not entirely responsible for adopting this attitude toward recovery programs. Many underestimate the hold that addiction has on them, so they assume that the fastest treatment is the best. The 30-days to recovery is often viewed as just that – endure treatment for 30-days and you will achieve long-lasting recovery. 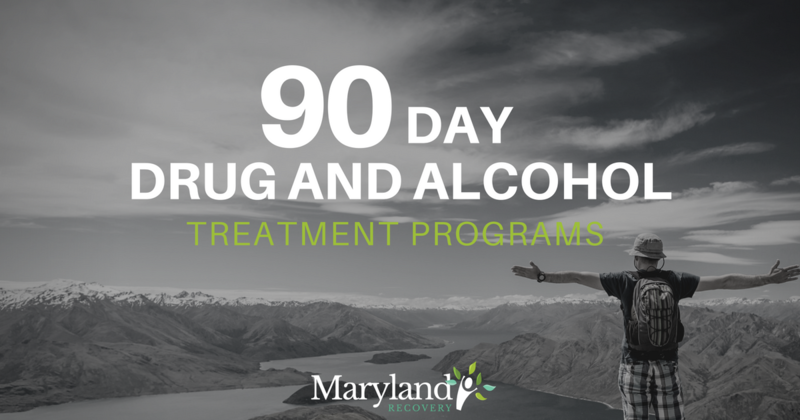 Because the 30-day treatment model is by definition limited, patients tend to limit their sobriety efforts during this one-month period. This compartmentalized drug and alcohol addiction treatment model does not give patients the tools that they need for long-term recovery – instead, it increases their likelihood of relapse and may tank their drive to become healthy again. Each seemingly failed attempt at a new life hurts future chances of change. ***NOTE – 30-day treatment programs CAN be very helpful and some individuals can achieve long-lasting recovery in the shorter rehab problems, though the chances of success are greatly increased at the 90-day level. Like any chronic disease, time is crucial to healing. Addiction is no different, especially as more research suggests that addiction itself is a disease. The standard must shift from short-term addiction treatment to longer-term addiction treatment. New standards for treatment programs should have a minimum duration of 90 days and a desired course lasting a full year, beginning with a patient’s first day of recovery. Those participating in a 30-day treatment model may feel pressured to accomplish too much in too little time, leaving the highest intensity of treatment as the only option. A transitional model, on the other hand, offers a refreshing, multi-intensity level plan, resulting in a successful long-term outcome. A 30-day model ushers the patient through the rehabilitation process, but it neglects the recovery phase. The transitional level, long-term recovery model offers a continuum of care spanning over all phases of addiction, from rehab to recovery. Moreover, the transitional plan would help guide the patient through issues faced in early recovery in a safe clinical setting, as opposed to the 30-day treatment model that ends before the recovery phase ever begins. Unlike the 30-day treatment model, the transitional treatment model places a patient on track to be self-supportive, family involved, and career equipped. Some patients criticize a longer treatment model for being, well, too long. But addiction takes time to develop. Considering how long it takes to become dependent should give some people insight into what it will take for them to get clean. If patients are serious about long-term recovery, they must invest time for it. Patients may object to treatment by claiming that it will impede their lives, careers, and families. But it will be much worse if they go for treatment and then fail. The best response to any of these objections is to tell the truth: that long-term addiction treatment is the best option for long-term addiction recovery. The more time people spend working toward an addiction-free life, the higher their chances of recovery are. The more we understand about addiction, the more it becomes apparent that time is crucial. In fact, The National Institute of Drug Abuse (NIDA) explained that recovering addicts show the most improvement at about three months of treatment. More treatment is better, but those first three months are crucial to healing. Additionally, NIDA claimed 90-day addiction treatment programs should be the new standard for successfully treating substance abuse disorders. A 90-day addiction treatment model is necessary to experience substantial improvement. More time is better, but 90 days can mean real improvement – which isn’t really possible in 30-days. If there are still skeptics of the 90-day model, consider the plethora of deeply rooted issues that lie under the surface of an alcohol addicts treated condition: traumatic life events, family breakdown issues, bi-polar, depression, anxiety, ADHD, OCD, personality disorders, and suicidal ideation. As we’ve mentioned, addiction doesn’t exist in a vacuum. What has lead a person down the path of substance abuse must be dealt with before treatment can truly begin. Uncovering such painful factors takes time. Days 1–14 : Detox and stabilize patient. Days 15–30 : Identify and treat the deeply rooted issues. Equip the patient with the necessary solutions to return home and lead a fulfilled life of sobriety. Why does a 30-day treatment plan not work? It’s too short. It’s not the right treatment. Thirty days isn’t enough time to treat issues that have likely been plaguing an addict for a lifetime. Imagine a physician who prescribes a cancer patient eight months of chemotherapy and radiation, significant lifestyle changes, a specific diet, and yearly follow-ups until the end of life. If the patient stops chemotherapy and radiation treatments after 40 days and still shows signs of malignancy, the treatment itself (chemotherapy and radiation) isn’t to blame, but the method of treatment (40 days instead of eight months) is. Likewise, the effectiveness of alcohol rehabilitation therapy shouldn’t be held responsible for unsuccessful recovery attempts – the 30-day method of treatment should be. According to studies, continued substance abuse alters the brain’s chemistry. Unlike other body organs that can be detoxified during short-term treatment, the restoration of the brain’s full health demands long-term treatment – up to two years. According to Yale University, the addiction-impacted brain takes 90 days to reset to normal. Successful addiction recovery that ends in life-long sobriety starts when patients are given the proper time to recover in the context of long-term treatment. The greatest challenges faced in alcohol addiction rehab include addressing the patient’s deeply rooted underlying issues, providing adequate time for the brain to heal, and solving familial constraints. Patients must be able to recover in a safe setting and trust their provider. Patients need to fully invest their effort into the treatment plan and have the time to recover. None of these addition-recovering necessities can be satisfied through 30-day treatment. Addiction is a collective problem in our nation and an individual problem in the lives of our loved ones. A 90-day individual long-term rehabilitation, or a continuum of care rehabilitation, should be the standard of initial addiction treatment that spans the first year of recovery. There is no short-term, 30-day treatment plan substitute for what the research-proven, 90-day treatment plan provides. This entry was posted in Rehab Information and tagged 90-day Addiction Treatment, Long Term Rehab, Outpatient Care on December 21, 2016 by mdrecovery.